The power of the subpoena is mighty and dates back to ancient Roman law. Its subsequent use and specific procedures were developed extensively throughout several hundred years of English common law. As expected both Federal and State courts throughout the United States have specific laws and procedures regarding the use of a subpoena. Both criminal and civil law attorneys regularly use the power of a subpoena to obtain documents, tangible evidence, and compel witness testimony to aid in trial preparation of their respective case. Put simply, subpoenas are a vehicle to discover information which in turn allows a lawyer to prove or defend a civil or criminal case. A recent ruling by the California Supreme Court on the ability of a lawyer to subpoena social media giants like Facebook and Twitter could have nationwide impact. 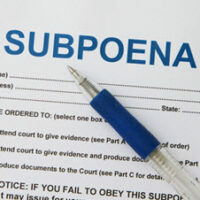 Subpoena Ad Testificandum: orders a person to testify in person at a deposition or court hearing or face punishment. Subpoena Duces Tecum: orders a person or organization to bring physical evidence before the ordering authority or face punishment. This is often used for requests to mail copies of documents to requesting party or directly to court. Subpoenas are usually issued by the clerk of the court in the name of the judge presiding over the case. Additionally, court rules may permit lawyers to issue subpoenas themselves in their capacity as officers of the court. Typically subpoenas are issued “in blank” and it is the responsibility of the lawyer representing the plaintiff or defendant on whose behalf the testimony is to be given to serve the subpoena on the witness. If a witness is reluctant to testify, then the personal service of subpoena is usually required with proof of service by non-party server. The subpoena will usually be on the letterhead of the court where the case is filed, name the parties to the case, and be addressed by name to the person whose testimony is being sought. This recent ruling would only affect cases filed under California state law, not Federal, and certainly not other State cases. However, other jurisdictions often look at cutting-edge legal precedent set by State Supreme Courts as persuasive authority in guiding their own legal opinions on similar issues. Facebook Inc. and Twitter Inc. must turn over public social media posts to murder suspects because doing so doesn’t violate federal stored data laws, the California Supreme Court ruled. Derrick Hunter and Lee Sullivan, facing state murder charges in alleged gang-related killings, subpoenaed Facebook, Instagram LLC, and Twitter for public and private communications. Hunter and Sullivan demanded deleted messages of the homicides victim and a prosecution witness. The murder suspects sought the information “in order to properly prepare for trial” to defend against the charges, according to the May 24 opinion. Social media companies don’t have to turn over stored private communications to defendants in a criminal trial because they don’t fall under one of the exceptions to the Stored Communications Act, which limits the release of information held by companies, the court ruled. The social media companies moved to quash the subpoena, arguing that under the federal SCA, they can’t “knowingly divulge to any person or entity the contents” of any communication they store. The companies argued that the SCA limited them from disclosing private and even public social media posts. The social media companies also alleged that turning over stored online posts to users would be burdensome, especially in regard to deleted communications. Hunter and Sullivan argued that provisions of the SCA violated their Fifth Amendment and Sixth Amendment constitutional rights because the law limited the release of information needed for the pre-trial process. The California state trial court agreed, but the state court of appeals sided with the social media companies and ordered that the communications not be turned over under the subpoena. The state’s top court overturned that ruling, ordering the appeals court to remand the case back to the trial level to decide what communications can be obtained under the defendant’s subpoena. The case is Facebook, Inc. v. Superior Court of City of S.F. ex rel Hunter, 2018 BL 184681, Cal., No. S230051, 5/24/18. Contact Nicholas G. Matassini, a Board Certified Criminal Trial Lawyer, for a free confidential consultation regarding your State or Federal criminal prosecution. Since 1976 The Matassini Law Firm, P.A. has provided comprehensive representation in State and Federal criminal investigations, including post-conviction and appellate litigation.